One of the key features introduced with the new Advanced Global Intercompany (AGIS) in R12 of Oracle E-Business Suite is the ability to create documentation for Intercompany transactions. The correct documentation is required in many countries for Intercompany trading, this essentially means I need to provide a Receivables Invoice for the Legal Entity Providing the goods or service and a payables invoice for the receiving Legal Entity. These invoices should have any taxes that are applicable in the jurisdictions, for that type of service. We do not firce you to create invoices for all Intercompany Activity, you can still create just a GL Journal entry if you prefer. The AGIS transactions flow is illustrated in the diagram below. You can see that we check if invoices are required and there are two places that we look for that. First is the AGIS transaction type flag, seen on the AGIS Transaction Page in the Set Up Tab. You can also create a rule in the Legal Entity setup, we create that rule at the registration level. This is set by selecting the Legal Function ‘Create Intercompany Invoice’ when entering the Legal Entity Registration. If the this rule is set for one of the Legal Entity involved in an AGIS transaction it will take precedence over the Transaction Type rule and the invoice will be created. We create an AR invoice (via an Invoice API or the Open Interface tables) at that point the eTax module will kick in and calculate the tax for you and add that to the invoice. When the AR invoice has been created we create the AP invoice (via the AP Invoice Interface) using the invoice number from the AR invoice – so should be easy to match those invoices. We also ensure that the same information required by eTax is on the AP invoice so the tax calculation will be the same on the AR and AP invoices. On of the key aspects of AGIS is that we will not create an AR or AP invoice or a GL journal until both sides of the transactions have approved it and we checked that the appropriate periods are open in GL, AP or AR. This means that there is no possibility of one side of the transaction going through and then the other side rejecting or changing the Accounting Date so they hit different periods or anything else that will make reconciliation and elimination of Intercompany cumbersome. It may look like a weird question, but does AGIS also offer intracompany invoicing? To be honest, I doubt that it is possible because the invoicing part is contradictory to the term intracompany. But I came across the requirement to generate invoices for transactions between operating units of the same legal entity. I guess that I will have to create a legal entity for every one of those operating units if I want to have the invoicing. you can do inter or intra company transactions in AGIS. Just create 2 intercompany organizations and assign them to the same LE. Then you can create transactions with invoicing if desired. We deliberatly allow this functionality as it is a requirement we have heard. I use Oebs 11.5.10. I have simple inter company set-up( Oracle Inventory User’s Guide – intercompany Invoicing). I do not use GIS. Now I am preparing to upgrade to 12i. That I have question. Do I have to set-up AGIS to use my present functionality? There’s two options on the Intercompany Transaction types, they are Allow Invoicing and VAT taxable. Can you please let me know what happens wif these options are enabled?? Do i need to run any concurrent program so as to appear this in the Inbound. You need to make sure your workflow background processes are running. The workflowpicks up the transactions and processes them, changing the status. We process shared services transactions whereby entities from separate ledgers are processed by one entity in behalf of others. This occurs with AP and Customer invoices and their liquidation. Besides the problem of applying the receipt to the customer invoice – which can only be done where the invoice applied to is in the same operating unit in which the receipt is being applied. We plan to populate I/C segment to identify transactions done “in behalf” of other BSVs/Comapnies within the family of companies. I was thinking of extracting all transactions with distributions where the BSV is to a different value than that in the I/C segment (where I/C segment is not zero’s). Then using this with some code to get a file in the right format to import into AGIS for processing the due to / due from portion of the entry. Is this viable? Have you heard of something similar? Can AGIS be used to capture AP trade invoices at the Shared Service entitiy and used to record the corresponding expense (example: utilities) in the seperate ledger for one of the other companies. So Shared service pays expense and creates AP Liab in ES ledger and IC clearing Account to the appropriate Company in ES ledger can this IC be “pushed to the appropriate comapny using AGIS. Or is AGIS only to capture the due to due from which looses the ability to tie this to the priginal AP expense. Hi Bill, I have similar situation. By now do you know if AGIS can help here? Follow up to last post on shared services: I know that AGIS will generate more than the due to due from pieces. AGIS posts to all intercompany organizations defined in any ledger. Is it possible within standard R12.1.3 functionality to create an intercompany or intracompany invoice based on a manual GL JE that is booked to a designated interco/intraco clearing account? Dear David, Please help with this misery. The Payables Open Interface Import program is generating additional tax line for every additional line if transaction. Payables Open Interface program creates extra tax line for each additional line item inherited from Receivables. The Total AR Invoice amount is constant at 180, while Total AP Invoice is incremental with additional tax line for each additional intercompany line transaction. Please, what could be the cause? Please I would appreciate your quick assistance. Thanking you in anticipation of your help. Is it possible for us to create an AGIS invocie with Zero Amount? From memory i would say yes. As long as you don’t set a minimum transaction amount in the system options I think this should work. However, I am not sure what the business need is, why do you need a zero invoice? 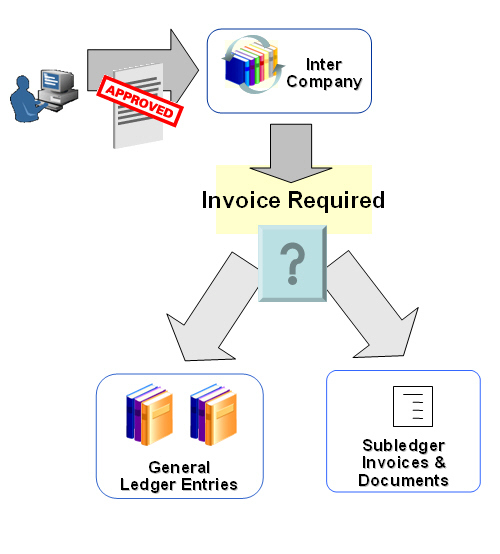 How would an entry at the subledger level or at the General Ledger level interact with AGIS? Would AGIS still pick up these transactions? I have done the set up of transaction type, In invoice option could you please show me how to create the GIS of i’m the customer and I have contact with supplier or opposite. I was hoping you can help me answer a question on AGIS in relation to the AR invoice created. My issue is i have multiple lines ie 3 lines on my AGIS, when I import to AR from the AGIS module, AR is creating 3 individual invoices for each line rather then one invoice with the 3 lines, is there a way in the setup in AR to change this or is this not possible? I think there is a way in AR to control the grouping of the lines that come in through the AR Interface. I am not an expert in AR so could not tell you exactly step by step. AR Setup>System Options and select the grouping rule. Hi….can you use AGIS for inventory (i.e., direct shipments from Mfg to Sales branches)? Have other customers chosen AGIS over Create Interco AR/AP? If so…..any issues? We are exploring this because we want to support only one method of interco invoicing…..not multiple. Hi….how hard is it to do cross-instance AGIS transactions? Would we have to build our own integration? Both instances are running 12.1. You would need to build some integration, but the architecture is such that you can do it with non invasive customizations. Without getting into too much details, you just use the Workflows and Business Events to trigger moving it to the remote instance. Have you dealt with instances where the intercompany transaction (Loan) from one LE to another LE but the flow of the transaction goes through a number of companies and holding company. So the flow of the loan is between 2 entities but the flow of the legal is through 5 LEs. David, I have an AGIS question: can we use AGIS via AR/AP when we have 1 LE, 1 OU, 1 Ledger with multiple BSV’s? I am looking for the confirmation whether it works or not. Your Blog seems to be very interesting. I have a query- How can we process an intracompany transaction across two OU’s that falls under different ledgers and different Business groups. It is a shipping transaction, basically Order is booked in an OU but the shipping is done from another OU directly to the customer. Now we have done the setup, but the intracompany Invoicing programing is failing or ending up with Warning, and no records are being fetch by the program. If the program is not picking anything up, you need to file an SR with Oracle Support. Thanks for your prompt revert. We surely are working with Oracle. Need a small confirmation from your side, is it feasible to carry out intercompany transaction across BG’s with Invoicing ?? Sorry its not intracompany its inter-company. Problem Summary : Can AP invoices be entered with distributions to company codes in other ledgers? I have intercompany accounting set up so I can enter a manual intercompany journal in AGIS with company codes in multiple ledgers that are automatically balanced and posted to the relevant ledgers. Is there a way to use this in AP? I would like the AP user to be able to enter an invoice with a line distribution to a company code that is in a different ledger. Then intercompany balancing rules would be applied so that the accounting for the invoice would automatically be balanced by company and journal entries created in multiple ledgers, in the same way as is done for the manual intercompany journal entry. I do not need invoicing between the companies. I only need the accounting for an external AP invoice to be distributed to multiple companies and multiple ledgers. I have succeeded in entering invoices with other company codes in the *same* ledger, but company codes in other ledgers are not available for selection. This is not possible, an AP invoice distribution can only be entered for the same ledger that the Invoice is entered into. Rather than manually create AGIS Manual transactions for these, a lot of people write a simple custom program to take the external invoice details (you might use a dff or other method to mark which ledger/company code the distribution or invoice line needs to go to, or derive it programmatically from information already on the invoice liens/distributions) and inset them into the AGIS open interface to generate an AGIS Manual transaction that will generate GL journals for the different ledgers involved. If you use auto-approval, this can be a straight through automated process that users do not need to do manually. 1. Can AGIS send transactions to other ERP systems other than Oracle APPS? 2. Can AGIS deal with Receipts ? Can we upload and apply receipts via AGIS. 1. The architecture is open and uses the workflow business event system, so you could do this with some safe non invasive custom integration work. 2. We do not deal with receipts, the invoice is not held in AGIS, you would apply the receipt to the invoice in the AR module. 2. I assume we can use AGIS but once the AR and AP is created, how do we close them? Obviously, you wouldn’t want to create dummy payments for the Interco AR and AP Invoices. How do we handle this? 1. For Intercompany transactions between 2 OU’s/LE’s, how to minimize work such that we don’t process AR/AP payments because both organizations belong to the same Corporate and how do we handle in GL? You have two options to close the AR and AP invoices. 2 – Create dummy bank accounts and do a payment run to close them out. This is what a lot of people do today, you can create the jobs/jobsets and schedule so it is all handled automatically, so should not be a big amount of work. Is it possible to have multiple Inventory OU and OM yet only 1 AR … all Sales order under all OM will be consolidated in 1 AR during AR invoice interface. I have never personally set this up, but as far as I understand it you should be able to have multiple LE in OM feeding a single AR OU. I would recommend a test to verify.